Mathematics and science were invented by humans to describe and understand the world around us. We live in a world that is defined by three spatial dimensions and one time dimension. Objects move within this domain in two ways. An object translates, or changes location, from one point to another. And an object rotates, or changes its orientation. In general, the motion of an object involves both translations in all three directions and rotation about three principle axes. On this page we are going to simplify the discussion and neglect changes in time and one of the spatial dimensions. So we will only consider motion in a two-dimensional plane. At the bottom of the page we include some comments about extending these ideas to three dimensions. To describe the motion of an object, we need to locate the object relative to some reference location. We will call the reference location the origin. We need two pieces of information to describe the location because the plane is two dimensional. There are many ways to specify the location of a point p relative to the origin. We will discuss two ways of making the determination. One way to specify the location of point p is to define two perpendicular coordinate axes through the origin. Each axis is a number line, with a length increment selected along the line. On the figure, we have labeled these axes X and Y and the resulting coordinate system is called a rectangular or Cartesian coordinate system. To determine the location of point p we measure out from the Y axis, parallel to the X axis, to obtain a distance Xp. And then we measure up from the X axis, parallel to the Y axis to obtain Yp. The pair of coordinates (Xp, Yp) describe the location of point p relative to the origin. The system is called rectangular because the angle formed by the axes at the origin is 90 degrees and the angle formed by the measurements at point p is also 90 degrees. So the measurment forms a rectangle with sides Xp and Yp. The system is called Cartesian because it was extensively used by the French mathematican Rene Descartes. Another way to specify the location of point p would be to directly measure the distance r between the origin and point p. But we need another piece of information. There are an infinite number of points that are a distance r away from the origin. They form a circle around the origin with radius r. To specify the location of point p, we can pick a reference line that goes through the origin and measure the angle theta formed by the reference line and a line going through point p. On the figure, we have made the reference line lie right along the Cartesian X axis. The coordinate pair (r, theta) uniquely describe the location of point p. This set of coordinates is called a polar coordinate system. 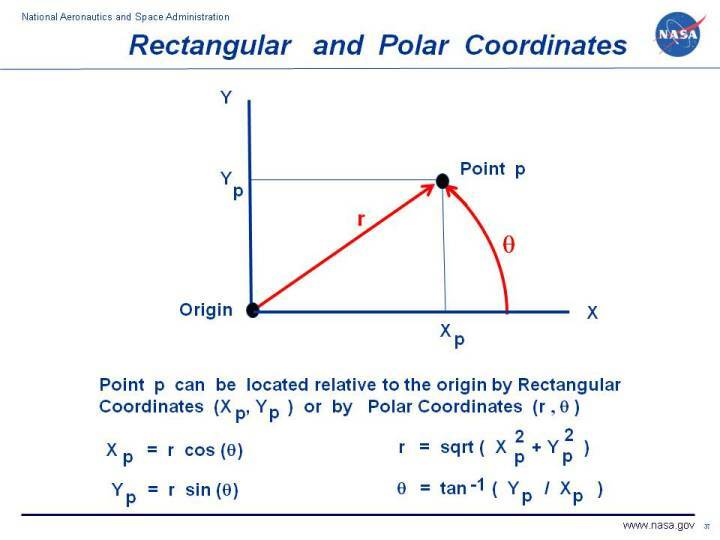 You will notice on the figure that the angular measurement theta crosses the radial measurement r by forming a 90 degree angle at point p. So a polar coordinate system is said to be an orthogonal coordinate system, just like the rectangular system. where sqrt is the square root function and tan^-1 is the inverse tangent or arc tangent function. On this slide, for simplicity, we have developed the coordinate equations in only two dimensions which requires two coordinate axes. For aircraft and rocket motion, there are three spatial dimensions and therefore three coordinates required. For rectangular coordinates, we can simply add a third axis Z that is perpendicular to both X and Y. This addition produces a rectangular Cartesian coordinate system consisting of X, Y, and Z. For polar coordinates, there are several different possibilities for describing the third dimension. We could add another axis Z that is perpendicular to the plane formed by r and theta. This addition produces a cylindrical coordinate system consisting of r. Z and theta. Or we could specify another angle phi that is perpendicular to the radius r and the angle theta. This addition produces a spherical coordinate system consisting of r, theta and phi. There are conversion equations that let you switch between any of these coordinate systems. There is a whole branch of mathematics called tensor analysis that deals with the subject of coordinate systems and how to convert between various coordinate systems. This subject becomes very important when we get into the details of calculus and how the values of variables change within a given coordinate system. The choice of coordinate system is often dictated by the geometry of a particular problem. For example, the surface of a tube is more easily described by a cylindrical coordinate system than by a spherical or rectangular coordinate system. It can be done with any three dimensional coordinate system, but the geometry favors the cylindrical in this case.